Our exclusive insider tips for Berlin will help you experience Berlin off the track. We put together after extensive research the best insider tips from fellow Berliners in order to ensure that you get the best out of your stay in Berlin. Just joking, spread the word and let your friends see the city with different eyes as well. If you want to learn something about the Berlin Wall then forget about Checkpoint Charlie that has become more of a Disneyland or East-side gallery. While the first one really is not worth a visit the latter one at least is nice to see because of all the art going on. But the real horror and meaning of being a divided city can best be experienced at Bernauer Straße. 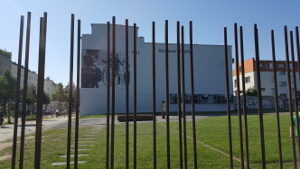 A mile-long stretch leads along the former frontier between West and East Berlin with some of the original artefacts still visible. Lot’s of signs explain e.g. where people digged tunnels from East to the West so they could escape to freedom or where people jumped out of the back of their house, as the main entrance was in the East and the backdoor facing the West. Just get the M10 to Nordbahnhof and walk all the way up to Eberswalder Straße. 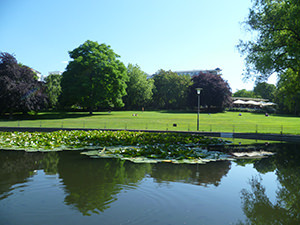 Berlin is surrounded by many lakes. But somehow in summer all the lakes seem so packed that you wonder if nobody in Berlin ever has to work. 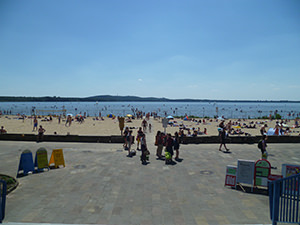 The most popular and famous lakes probably are Schlachtensee and Wannsee. While both of them are really pretty, they get incredibly packed in summer, as they are conviniently located just next to the S-Bahn. So unless you want to feel like in a Japanese subway all squeezed up you better go to Müggelsee in the East of Berlin, you will not regret it. Strandbad Müggelsee is really easy accessable, just hop on the S3 from Ostkreuz and you are there in no time. If you do not only want to sunbath you can also rent a boat or kayak and explore the area by water. 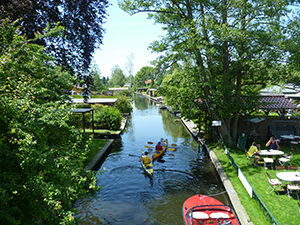 While you are already at Müggelsee you should definitely check out Neu-Venedig. Just stay one more stop on the S3 until Rahnsdorf and then take a short walk direction South and you will be surprised to find nice little channels and tiny houses right outside of Berlin. Things to do at Neu-Venedig include relaxing, renting a boat/kajak and paddling through the channels just to stop at one of the restaurants to get a snack and a drink. Unfortunately when the new Berlin airport one day opens this little gem will get a lot of the noise as planes are supposed to start and land over Müggelsee. If you are a soccer fan and you would like to watch one of the Bundesliga games live then forget about the Olympiastadium. While the stadium itself is really impressive and worth a visit even outside matchdays, to experience a real unique atmosphere make sure to watch a game of Berlin’s second football team FC Union. The fans are said to be very loyal, which is true if you think about it that they helped renovate the stadium as the club is only in second division and a bit short on money as it seems. And conveniently the stadium is also located close to Müggelsee and Neu-Venedig. So make sure to plan to spend a whole busy day out there. This one is up to you. 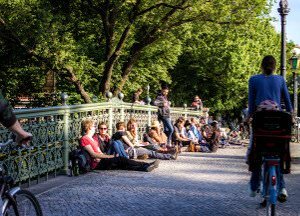 Would you rather pay 13€ minimum per person and wait 1h in line or would you rather pay 3€ and wait 1min in line to have the perfect view of Berlin? If you prefer option 1, which is completely overpriced and costs a lot of time then we recommend the Berlin TV tower to have a nice view of Berlin. 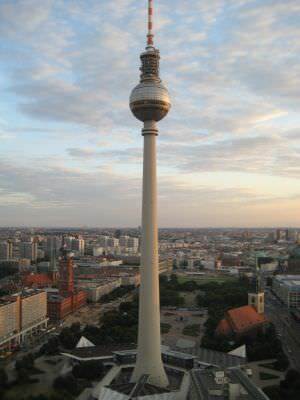 But if you like to save some time and money then just visit the rooftop terrace of the Park Inn Hotel, which is just next to the TV tower at Alexanderplatz. 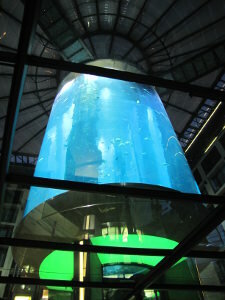 The Aquadom is the biggest cylindrical glass aquarium in the world. It is even that gigantic that it has space for an elevator inside it to take people up to the top. You could of course spend some money and see the Aquadom from inside, but you could also just walk into the Radisson Blue (not the front- but the side-entrance) for free and admire this gigantic beauty. Another idea would be to check in at the Radisson Blue and book a room with a view towards the inside of the building (meaning looking at the biggest cylindrical glass aquarium in the world). 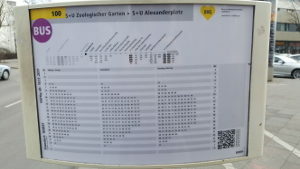 Save yourself 20€ for one of the many tourist busses and instead buy a BVG ticket for 2,80€ and hop on the bus line 100 (or 200) starting at Berlin Alexanderplatz. 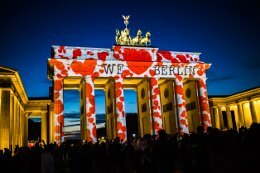 If you don’t mind hanging around other tourists we also have put together a list of the Top 10 things to do in Berlin. But don’t worry our tips are worth the hassle. Are you hungry after all these great things to see then it might be time to check out the best things to eat in Berlin. But do not count calories! Did you put on a little bit of weight after all these delicious things to eat? We thought about that as well and put together a list of the best sport activities in Berlin.